Mushrooms are one of those foods that people seem either to love or hate. Texture is the reason I hear cited most often by those who dislike them. For those with a penchant for fungi, there are more than 10,000 varieties of mushrooms in North America alone, about half of them edible. 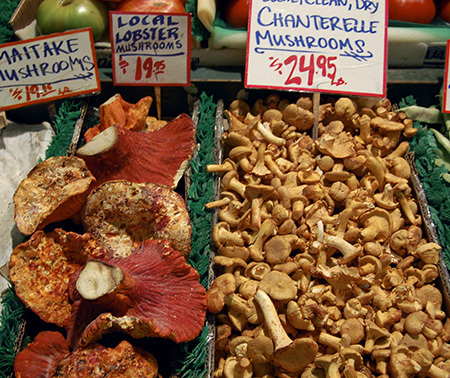 One of my favorite places to find many of those varieties is in Pike Place Market in Seattle, Washington. We went there last year on vacation. And you know what that means, right? I cooked. There were so many varieties available from my favorite green grocer in Pike Place Market: Frank's Quality Produce. The best news is that they will ship mushrooms to you when they are in season. 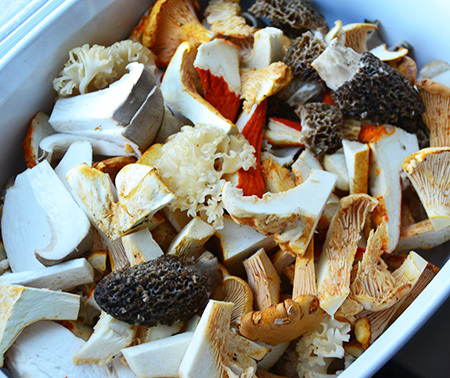 That day, I bought morels, lobster mushrooms, yellow chanterelles, white chanterelles, king oyster mushrooms, a couple of cauliflower mushrooms, and one black truffle, with the plan of making them into the most amazing pasta sauce ever. 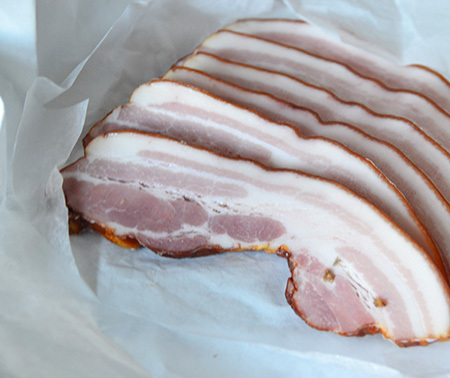 In a very large skillet over medium heat, melt the butter and sauté the pancetta and shallots until the pancetta is slightly golden and the shallots are clear and beginning to turn brown on the edges. Turn the heat to high and add the mushrooms. After a few minutes without stirring, the mushrooms will begin to release their moisture. Stir, and continue to sauté, stirring, until they are done. Season well with salt and plenty of black pepper. 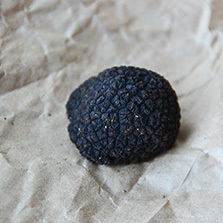 Add the truffle, if using, and cook for about 30 second. Then add the cream and cook to reduce the cream a bit. Remove from the heat, and prepare the pasta. Add a good handful of salt to the boiling water. Cook pasta for about 3 minutes, or until al dente. Remove from the pot, reserving cooking liquid. 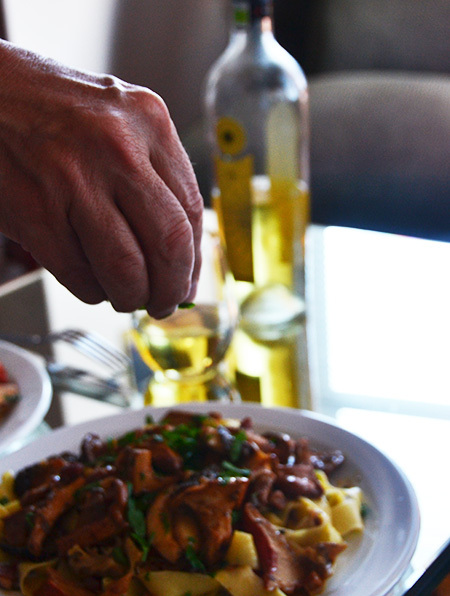 Return mushrooms to the heat, add the pasta, and toss well. Add a little of the pasta water, if needed, to make a creamy sauce. 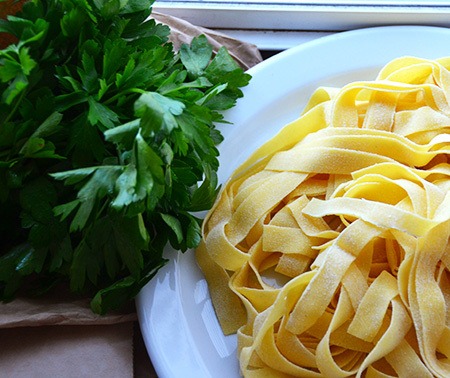 Divide among 4 plates and serve with chopped parsley and grated Parmigiano-Reggiano. Hi Marcelle! Yes, Pike's Place does ship anywhere! They certainly ship to Tucson! I am glad to see all my friends are mushroom lovers! Dear David, this looks like a celebration dish for all those funghi! Must have tasted amazing! Andrea - I loved all the different flavors and textures they gave! LOVE this kind of pasta! Just got back from Europe and had it a couple of times in Italy! Divine!! Even if I only had ONE type of mushroom, Christina, this would have been wonderful! I'm in the love em camp, David. A beautiful post. Thanks, Liz - a lot of fungi love out there! Yes, I would definitely tuck into this with absolute glee. I adore mushrooms, and I only wish I could go out with confidence and forage for them. Sadly my knowledge for mushrooms doesn't extend that far, so best to buy them at the markets! 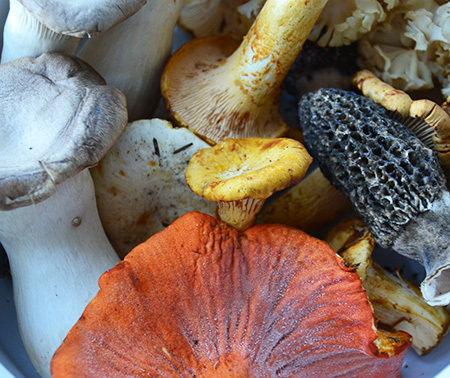 John - we are hoping to host a local mushroom foraging class for our alumni group this fall. Guess whose idea that was? :) I am very excited as there are many edible varieties in the mountains right behind our home! David, that is a beautiful dish! I want to sit down at your table and attempt to eat it verrrry slowly! And therein lies the difficulty, Jean, ... eating is slowly! This is delicious! Amazing recipe! Gorgeous post and meal! Wish you had been with us when we accompanied the local pharmacist in Lourmarin on a mushroom hunt! I would have loved that, Susan - I used to go foraging in Upstate NY when I lived there. So much fun to eat what you find! Well I'm one of those that love fungi. I could really go for a plate of your pasta right now and it is not even lunch time. Thanks, Karen, and congrats on your blogiversary! We love, love mushrooms here, oh this looks so delicious David, adding the truffle must of gave this dish a little something extra. Hope you and Mark are having a wonderful long week-end. 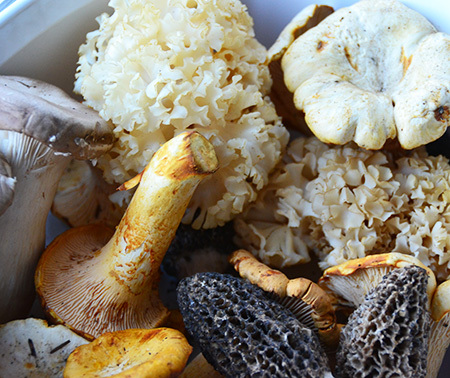 You are so lucky to be in the PNW now, Cheri - all those good mushrooms at your fingertips! 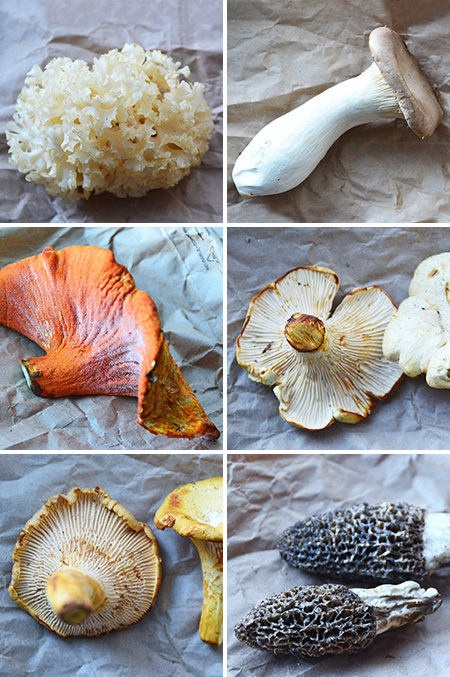 I'm in the love camp when it comes to mushrooms, especially the gorgeous varieties in these photos. (I think many people get to know mushrooms through the bland "button mushrooms" that you'll find in most supermarkets—no wonder they're not fans.) 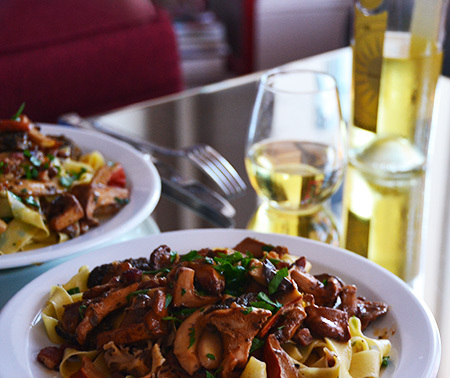 And your recipes for mushrooms over pasta is almost exactly like mine! I think I may use a tad more cream, but otherwise... great minds think alike, I guess! Looks wonderful. Well, Frank, truth be told.... I had sued most of the cream in out rentals apartment on a scallop dish, so I might have used much more like you! I agree - great minds think alike but so do great tastebuds! You, my friend, are very lucky! We have one vendor who grows shiitakes, and another who grows oysters. But other than that, it's the grocery store for us! What fun to try all of these unusual mushroom! Have you ever gathered your own mushrooms from the forest? It's a national pastime in a Poland. Every family has an expert. I've never had the opportunity, but my mother put a good scare in me as a child, so I don't know if I would be brave (crazy) enough to eat mushrooms that I''d picked from the wild. 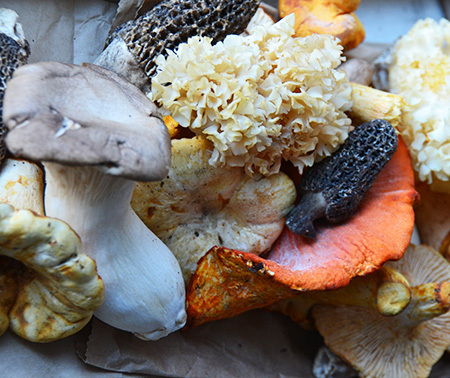 Lois - our alumni (and friends) club is going to do a mushroom foraging day this fall. I will let you know when so you can join (the "and friends" part). I used to do it in NY State, but haven't a clue here! Sounds like great fun, thanks!!! Good - I will be in touch! That's IT! I'm moving in next door to you! I love mushrooms! I didn't grow up eating them because my mom had this weird notion about them...more like old wives tale! Anyway, I discovered them on my own and loved them ever since. Our Whole Foods carries great variety so I get my mushroom in regularly. We also have a great local company, Hazel Dell who also ship, if you are interested. My family was only weird about canned mushrooms - so luckily we had plenty of fresh! I will check out Hazel Dell - good to know about - thanks, Nazneen! 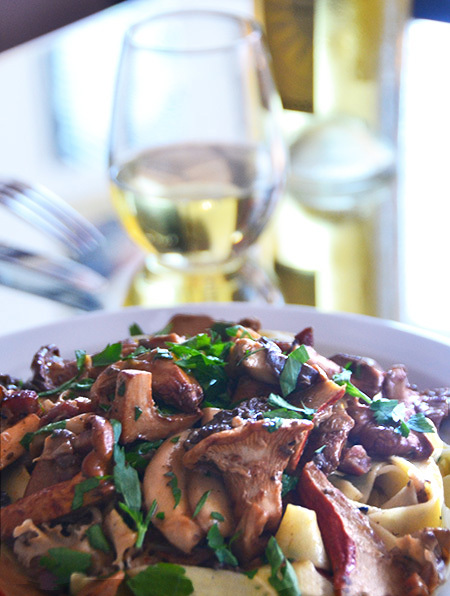 I love mushrooms and you have a fantastic collection in your pasta dish. I love to have some of it. What gorgeous photos David! Every spring we have been getting a handful of morels popping up in our backyard (knocking wood since they are so fickle) but not enough to do something with on their own. I could go out and pick up some more variety and this recipe would be perfect! Inger - how lucky are you? We were at the market yesterday and there were morels and porcini. It was a hard choice, but the porcini won! Wish I could have gotten both!